Another Beautiful Sunday in Paradise. The weather turned out to be very nice except it was a little breezy. 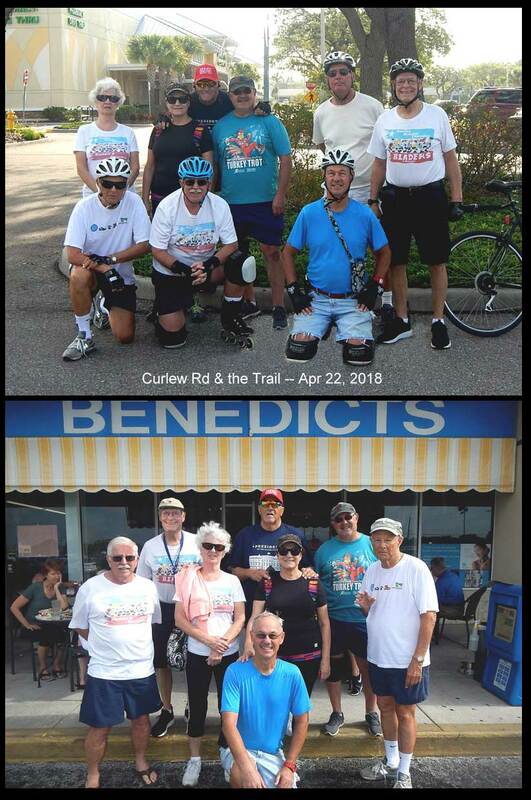 Bladers/bicyclers (back left) Carol J, Ginnie S, Rick P, Rob H, Roy H, Bruce M, (front left) Steve G, Dee T and Jeff B came. Welcome all. We talked about heading towards Honeymoon Island but decided to go North as usual. The big Trail bridge over Alt19 was still closed. In fact, it didn't even look like they had started to work on it yet. We had 2 Bladers and 7 Bicyclers. Most all did the round trip of 10.7 miles but a couple only did 8 miles. We Brunched at Benedict's as planned. All got in and seated after a short wait. The service was good, the coffee flowed freely and the food great as usual.